The biggest risk to an arbitrager is a runaway market. Let me frame that statement with backstory. I consider it our mission to help you understand market behavior. The biggest currently is arbitrage – taking advantage of price-differences. Insert that phrase wherever you see the word. We mean that much of the money behind volume is doing that. Yesterday eleven of the 25 most active stocks were Exchange-Traded Funds (ETFs). Four were American Depositary Receipts (ADRs). Both these and high-frequency trading turn on taking advantage of price-differences. Both offer the capacity to capitalize on changing prices – ADRs relative to ordinary-share conversions, and ETFs relative to the net asset value of the ETF and the prices of components. In a sense both are stock-backed securities built on conversions. For high-speed traders, arbitrage lies in the act of setting prices at different markets. Rules require trades to match between the best bid to buy and offer to sell (called the NBBO). Generally exchanges pay traders to sell and charge them to buy. In fact, the SEC suspended an NYSE rule because it may permit traders to take advantage of price-differences (something we’ve long contended). We’ll come to that at the end. Next, ETFs are constructed on arbitrage – price-differences. Say Blackrock sponsors an ETF to track a technology index. Blackrock sells a bunch of ETF shares to a broker like Morgan Stanley, which provides Blackrock with either commensurate stocks comprising the tech index or a substitute, principally cash, and sells ETF shares to the public. If there’s demand, Morgan Stanley creates more ETF shares in exchange for components or cash, and then sells them. Conversely, if people are selling the ETF, Morgan Stanley buys the ETF shares and sells them back to Blackrock, which pays with stocks or cash. The trick is keeping assets and stock-prices of components aligned. ETFs post asset positions daily. Divergences create both risk and opportunity for the sponsor and the broker alike. Blackrock cites its derivatives-hedging strategies as a standard risk associated with ETF investing. I’m convinced that a key reason why ETFs have low management fees is that the components can be lent, shorted, or leveraged with derivatives so as to contribute to returns for both the sponsor and the broker. On the flip side, if markets are volatile as they have been post-Brexit and really since latter 2014, either party could lose money on unexpected moves. So both hedge. For arbitragers, a perfect market is one with little direction and lots of volatility. Despite this week’s move to new market highs, there remains statistically little real market movement in the past two years. If a market is up or down 2% daily, does it over time gain, lose or stay the same? Run it in Excel. You’ll see that a market declines over time. Thus arbitragers short securities using rapid tactics to minimize time-decay. If you want a distraction, Google “ETF arbitrage shorting” and read how traders short leveraged ETFs to make money without respect to the market at large. In fact, this is the root problem: Taking advantage of price-differences is by nature a short-term strategy. Sixteen of the most actively traded 25 stocks yesterday (64% of the total!) were priced heavily by arbitrage, some by high-speed traders and some by investors and the market-makers for ETFs. Offering further support for arbitrage ubiquity, the market is routinely 45-50% short on a given day. Short volume this week dipped below 45% for the first time since December, perhaps signaling an arbitrage squeeze and certainly offering evidence that arbitragers hate a runaway market. If the market rises on arbitrage, it means parties SUPPLYING hedges are losing money. Those are big banks and hedge funds and insurance companies. Who’d take the market on a run to undermine arbitrage that’s eating away at balance sheets (big banks and hedge funds have suffered)? Counterparties. In our behavioral data Active investment is down and counterparties have been weak too, likely cutting back on participation. That comports with fund data showing net outflows of $70-$80 billion from US equities this year even as the market reverts to highs. The only two behaviors up the past 50 trading days are Fast Trading (arbitrage) and Asset Allocation (market-makers and brokers for ETFs and other quantitative vehicles). Yet more evidence. And both are principally quantitative. Assemble these statistics and you see why the market seems oblivious to everything from US racial unrest, to a bankrupt Puerto Rico, to foundering global growth and teetering banks. The market is running on arbitrage. What’s the good news, you ask? The SEC is aware of rising risk. It suspended an NYSE rule-filing on fees at the exchange’s Amex Options market after concluding the structure may incentivize arbitrage. The SEC is scrutinizing leveraged ETFs and could end them. But most important is the timeless self-regulation of knowledge. If we’re all aware of what’s driving the market then maybe the arbitragers will be their own undoing without taking the rest of us with them. Everybody adapts, including institutional investors like Janus. Rattle off a top-ten list of the best active stock pickers visited by teams of company execs and investor-relations pros trundling through the airports and cities of America, and Denver’s Janus likely makes the cut. Ah, but. In 2014 Janus bought VelocityShares, purveyor of synthetic exchange-traded products. Just as a drug manufactured in a laboratory rather than from the plant that first formed its mechanism of action is a replica, so are these lab-made financial instruments. They replicate the act of investment without actually performing it. Janus says it’s intending to offer a range of returns beyond simple capital-appreciation, including “volatility management” and “uncorrelated returns.” Janus’s VelocityShares directed at volatility aim to produce enhanced or inverse returns on the VIX, an index called the “fear gauge” for reflecting volatility in forward rights to the S&P 500. But traders and investors don’t fear volatility. They invest in it. On Monday May 16, four of the top 20 most actively traded stocks were exchange-traded products leveraging the VIX. Those offered by Janus aren’t equity investments but a debt obligation backed by Credit Suisse. Returns derive from what is best described as bets using derivatives. During the mortgage-related financial crisis there was a collective recoil of horror through media and into Congress that banks may have been betting against their clients. Well, come on. It’s happening in equities every day! Exactly how do we think somebody who says “sure, I’ll take your bet that you can make double the index without buying any assets” can possibly make good without farming the risk out to someone else? In the mortgage crisis we learned about “credit default swaps” and how insurers like AIG were on the hook for hundreds of billions when real estate stopped rising. Who is on the hook for all these derivatives bets in equities if stocks stop rising? It’s the same thing. Last Friday the 13th, five of the top 20 most actively traded instruments on the Nasdaq and NYSE were synthetic exchange-traded products attempting to produce outsized returns without correlating to the market. That’s 25% of the action, in effect. For stock-picking investors and public companies it means a significant contingent of price-setting trades in the stock market are betting on moves uncorrelated to either fundamentals or markets. You’ll find no explanation in ownership-change. What do you tell management and Boards about a market where, demonstrably, top price-setting vehicles like TVIX owned by conventional stock-pickers aren’t buying or selling stock but betting on tomorrow’s future values using derivatives? In fact, everyone is betting against each other – traders, banks, investors. I take you back to the mortgage-backed securities crisis. The value of underlying assets was massively leveraged through derivatives the values of which bore no direct connection to whether mortgages were performing assets. That by any definition is credit-overextension. A bubble. A mania. Then homes stopped appreciating. The bubble burst two years later. Look at stocks. They’ve not risen since Nov 2014. Is anyone out there listening or paying attention to the derivatives mess in equities? There’s a saying: It’s easier to keep the cat in the bag than to get it back in there once you’ve let it out. Nobody is likely to stuff the Exchange Traded Fund (ETF) cat back in the bag. The biblical story of creation is that something came from nothing. Same with the Christian concept of redemption – being bought for a price without rendering equal worth in kind. Today, we’ll share with occupants of the IR chair the divine story of how ETFs work. Before ETFs were closed-end mutual funds. Closed end funds (CEFs) are publicly traded securities that IPO to raise capital and pursue a business objective (like any business), in this case an investment thesis. Traded units have a price, and the net asset value rises and falls on the success of managers in achieving objectives. The rub with CEFs is that share value can depart from net asset value – just like stocks often separate from intrinsic business worth. Suppose you were human resources director for a fleet of driverless taxis. As Elon Musk proposes streets full of autonomous autos, the market has become that fleet for investors and investor-relations professionals. The market drives itself. What we measure as IR professionals and investors should reflect a self-driving market. There’s nothing amiss with the economy or earnings. About 78% of companies reporting results so far this quarter, FactSet says, are beating expectations, a tad ahead of the long-term average of 72%. But a closer look shows earnings unchanged from a year ago. In February last year with the market anticipating earnings goosed by the corporate tax cut of 2017, stocks plunged, and then lurched in Q3 to heights we’re now touching anew, and then nosedived in the fourth quarter. An honest assessment of the market’s behavior warrants questioning whether the autonomous vehicle of the market has properly functioning sensors. If a Tesla sped down the road and blew a stop sign and exploded, it would lead all newscasts. No matter the cacophony of protestations I might hear in response to this assertion, there is no reasonable, rational explanation for the fourth-quarter stock-implosion and its immediate, V-shaped hyperbolic restoration. Sure, stocks rise and fall (and will do both ahead). But these inexplicable bursts and whooshes should draw scrutiny. Investor-relations professionals, you are the HR director for the driverless fleet. You’re the chief intelligence officer of the capital markets, whose job encompasses a regular assessment of market sensors. One of the sensors is your story. But you should consistently know what percentage of the driving instructions directing the vehicle are derived from it. It’s about 12% marketwide, which means 88% of the market’s navigational data is something else. Investors, the same applies. The market is as ever driven by its primary purpose, which is determined not by guesses, theory or tradition, but by what dominates price-setting. In April, the dominating behavior is Exchange-Traded Funds. Active investment was third of four big behaviors, ahead only of Fast Trading (curious, as Fast Traders avoid risk). ETF shares are priced by spreads versus underlying stocks. Sure, investors buy them thinking they are consuming pooled investments (they’re not). But the motivation driving ETFs is whether they increase or decrease in price marginally versus stocks. ETF market-makers supply stocks to a sponsor like Blackrock, which grants them authority to create an equal value of ETF shares to sell into the market. They aim to sell ETFs for a few basis points more than the value of exchanged shares. The trade works in reverse when the market-maker borrows ETF shares to return to Blackrock in exchange for a group of stocks that are worth now, say, 50 basis points more than the stocks the market-maker originally offered. If a market-maker can turn 30-50 basis points of profit per week this way, it’s a wildly winning, no-risk strategy. And it can and does carry the market on its updraft. We see it in patterns. If it’s happening to your stock, IR professionals, it’s your job to know. Investors, you must know too, or you’ll draw false conclusions about the durability of cycles. Big Market Lesson #1 in 2019: Learn how to measure behaviors. They’re sensors. Watch what’s driving your stock and the market higher (or lower – and yes, we have a model). Speaking of learning, IR people, attend the 50th Anniversary NIRI Annual Conference. We have awesome content planned for you, including several not-to-be-missed market-structure sessions on hedge funds, the overall market, and ETFs. Listen for a preview here and see the conference agenda here. Sign up before May 15 for the best rate. Big Market Lesson #2: Understand what stops a driverless market. ETF-led rallies stall when the spread disappears. We have a sensor for that at ModernIR, called Market Structure Sentiment™ that meters when machines stop lifting or lowering prices. It’s a 10-point scale that must remain over 5.0 for shares to rise. It’s averaged 6.2 since Jan 8 and has not been negative since. When it stalls, so will stocks, without respect to earnings or any other fundamental sensor. I look forward to driverless cars. But we’ll want perfected technology before trusting them. The same should apply to a driverless stock market. Blackrock CEO Larry Fink sees risk of a melt-up, not a meltdown for stocks. Back to Larry Fink, is he right? Who knows. But Blackrock wants to nudge record sidelined retail and institutional cash into stocks because revenues declined 7%. Data tell us the market doesn’t need more buyers to melt up. Lipper said $20 billion left US equities from Jan through Apr 3, more than the $6 billion Bloomberg had earlier estimated. Stocks rallied 16%. We wrote April 3 that no net cash fled equities in Q4 last year when the market corrected. If stocks can plunge when no money leaves and soar when it does, investors and public companies should be wary of rational expectations. We teach public companies to watch for behavioral data outside norms. Investors, you should be doing the same. Behavioral-change precedes price-change. It can be fleeting, like a hand shoved in a bucket of water. Look away and you’ll miss the splash. Often there’s no headline or economic factor because behaviors are in large part motivated by characteristics, not fundamentals. Contrast with what legendary value investor Benjamin Graham taught us in Security Analysis (1934) and The Intelligent Investor (1949): Buy stocks discounted to assets and limit your risk. The market is now packed with behaviors treating stocks as collateral and chasing price-differences. It’s the opposite of the Mr. Market of the Intelligent Investor. If we’re still thinking the same way, we’ll be wrong. When the Communication Services sector arose from Technology and Consumer Discretionary stocks last September, the pattern of disruption was shocking. Unless you saw it (Figure 1), you’d never have known markets could roll over. Larry Fink may think money should rush in (refrains of “fools rush in…”) because interest rates are low. Alan Greenspan told CNBC last week there’s a “stock market aura” in which a 10% rise in stocks corresponds to a 1% increase in GDP. Stocks were down 18% in Q4, and have rebounded about 16%. Is the GDP impact then neutral? To me, the great lesson for public companies and investors is the market’s breakdown as a barometer for fundamentals. We’ve written why. Much of the volume driving equities now reacts to spreads – price-differences. In a recent year, SPY, the world’s largest and oldest Exchange Traded Fund, traded at a premium to net asset value 62% of the time and a discount 38% of the time. Was it 2017 when stocks soared? No, it was 2018 when SPY declined 4.5%. Note how big changes in behavioral patterns correspond with market moves. The one in September is eye-popping. Patterns now are down as much as up and could signal a top. SPY trades 93% of the time within 25 basis points of NAV, but it effectively never trades AT net-asset-value. Comparing trading volume to creations and redemptions of ETF shares, the data suggest 96% of SPY trading is arbitrage, profiting on price-differences. This is the stuff that’s invaded the equity market like a Genghis Kahn horde trampling principles of value investment and distorting prices. So, what do we DO, investors and public companies? Recognize that the market isn’t a reliable barometer for rational thought. If your stock fell 40% in Q4 2018 and rebounded 38% in Q1, the gain should be as suspect as the fall. Ask why. Ask your exchange. Ask the regulators. Ask the business reporters. These people should be getting to the bottom of vanishing rationality in stocks. It may be the market now is telling us nothing more than ETFs are closing above net asset value and ETF market-makers are melting stocks up to close that gap. That could be true 62% of the time, and the market could still lose 20% in two weeks. When you hear market-behavior described in rational terms – even during earnings – toss some salt over a shoulder. I think the market today comes down to three items: Sentiment reflecting how machines set prices, shorting, and behavioral change. 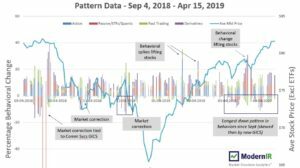 Behavioral patterns in stocks now show the biggest declines since September. Sentiment reflecting how machines set prices is topped ahead of options expirations that’ll be truncated by Good Friday. Shorting bottomed last week and is rising. Nobody knows the future and we don’t either. Behaviors change. But the present is dominated by characteristics, powerful factors behind behavioral patterns. What I mean is, Forex (FX) is the world’s most active trading market, with some $5 trillion daily in currencies changing hands on a decentralized global data network. It can teach us how to think about the effects of Exchange-Traded Funds (ETFs) on stocks. It’s a 24-hour-a-day market, is FX. And by the way, I’m moderating a panel called “24 Hours of Trading: What You Should Know About Market Structure” Friday at the NIRI Silicon Valley Spring Seminar. We’re the closing panel, and happy hour follows, so come learn from our outstanding guests and stay for a beverage. Every investor-relations professional should know how the stock market works now, because the reason we have jobs is the stock market. Back to our thesis, ETFs trade like currencies. So they’ll have the motivation found in currency-trading. Currencies trade in pairs, like the dollar/euro, and transactions are in large defined blocks. Most FX trades are bets that a currency will move up or down, producing a profit. It’s always a pair – if you’re selling a currency, you’re buying another. The transactions that create ETFs are also in blocks, though they occur off the stock market between ETF creators and broker-dealers. If you want to know more, read this. The pair in ETF trading is stocks. In fact, ETFs by rule must have what the SEC terms an “arbitrage mechanism.” That’s esoterica meaning there are two markets for ETFs, fostering different prices for the same thing. ETFs are created wholesale off-market in big blocks and sold retail on the market in small pieces. The big profit opportunity, though, as with currencies, is in the pair, the underlying stocks. They move apart, creating profit opportunities. Last week, the average spread between the stocks comprising a sector and the ETF for trading that sector was 57 basis points (we wrote about these spreads). No wonder ETFs are cheap for investors. You can make as much trading them in a week as Active investment managers charge for managing portfolios for a year (SEC: why do ETFs charge a management fee at all, since they don’t manage customer money?). Let me use an analogy. Picture a gold-backed currency. There’s a pile of gold. There’s a pile of money representing the gold. To have more money, there must be more gold. Of course, all gold-backed currencies have dropped the gold, because the pile of gold, which is hard to get, fails to pace the easy creation of paper. ETFs are stock-backed currencies. There are piles of stocks off the market. There are piles of ETF shares issued into the stock market that represent the value of stocks. Managing collateral isn’t really investment. The head of equities for a big global asset manager told me they’d gotten into ETFs because of a decade-long rout of assets from stock-picking funds. He said it’s a completely different endeavor. There are no customer accounts to maintain. The focus is tax-efficiency, managing collateral, constructing the basket, relationships with Authorized Participants who create ETF shares. He said, “And then what do you need IR (investor relations) for?” They’re not picking investments. They’re efficiently managing the gold backing the currency. She meant “arbitrage opportunity” not as a good thing but as a consequence of too much passive money. The focus of the market shifts to spreads and away from fundamentals. The QQQ is a big success. But ETFs have now exploded. Much of the volume in ETFs is arbitrage, because the arbitrage mechanism is the only way they can be priced – exactly like currencies now. Investors and public companies act and think and speak as though fundamentals and economic facts are driving the market. The more the market shifts toward collateral and currency, the less fundamentals play a pricing role. This is how ETFs are giving stocks characteristics of an FX market where the motivation is profit on short-term spreads. Like currencies, changes in supplies are inflationary or deflationary. Consider how hard it is for countries to reduce supplies of currency. Whenever they try, prices fall. Falling prices produce recessions. So instead countries don’t shrink currency supplies and we have catastrophic economic crises. Are ETF shares keeping pace with the assets backing them? It’s a question we should answer. And IR folks, your relevance in this market is as chief intelligence officer measuring all the forces behind equity value. You can’t remain just the storyteller. 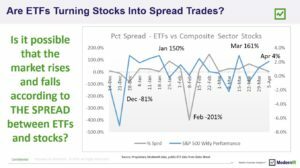 Did Exchange Traded Funds drive the recent market rollercoaster? The supply of ETF shares moved opposite the market. The S&P 500 fell about 16% in December and rose around 19% from Dec 24 to March 5. In December, says the Investment Company Institute, US ETFs created, or introduced, $260 billion of ETF shares, and redeemed, or retired, $211 billion. So as the market tumbled, the number of ETF shares increased by $49 billion. We saw the reverse in January as the market soared, with $208 billion of ETF shares created, $212 billion redeemed, the supply shrinking a little. If ETFs track indexes, shouldn’t available shares shrink when the market declines and increase when the market rises? Why did it instead do the opposite? One might point to the $46 billion investors poured into equity ETFs in December at the same time they were yanking $32 billion from Active funds, says Morningstar. Again a contradiction. If more money flowed to equities than left, why did the S&P 500 fall? Don’t stocks rise when there are more buyers than sellers, and vice versa? The fact that data and market behavior are at loggerheads should cause consternation for both investors and public companies. It means we don’t understand supply and demand. One explanation, the folks from the ETF business say, is that inflows to ETFs may have been short. That is, when ETF shares increase while stocks are falling, ETF creators are borrowing stocks and trading them to Blackrock and Vanguard to create ETF shares for investors, who borrow and sell them. But if true, the unique characteristics of ETFs that permit them limitless supply and demand elasticity contributed to the market correction. We cannot manufacture shares of GE to short. But ETF market-makers can manufacture ETF shares to short. How is that helpful to long-only investors and public companies? The behavior of stocks separates from fundamentals purely on arbitrage then. Here’s another statistical oddity: The net shrinkage in January this year marks only the third time since the 2008 Financial Crisis that the monthly spread between ETF creations and redemptions was negative. The other two times were in February and June last year, periods of market tumult. And still the ETF supply is $45 billion larger than it was when the market corrected (near $55 billion if one adds back market-appreciation). We conducted an experiment, tracking week-over-week gains and losses for stocks comprising the eleven General Industry Classification System (GICS) sectors and comparing changes to gains and losses for corresponding sector ETFs from State Street, called SPDRs (pronounced “spiders”) from Dec 14 to present. Startlingly, when we added up the nominal spread – the real difference between composite stocks and ETFs rolled up across all eleven sectors – it was 18%, almost exactly the amount the market has risen. What’s more, on a percentage basis the spreads were not a penny like you see between typical best bids to buy and offers to sell for stocks. They averaged 5% — 500 basis points – every week. The widest spread, 2,000 basis points, came in late December as stocks roared. Now the spread has shrunk to 150 basis points and markets have stopped rallying. Might it be that big spreads cause traders to chase markets up and down, and small spreads prompt them to quit? Now, maybe a half-dozen correlated data points are purely coincidental. False correlations as the statistics crowd likes to say. What if they’re not? Tell me what fundamental data explains the market’s plunge and recovery, both breath-taking and gravity-defying in their garishness? The economic data are fine. It was the market that wasn’t. What if it was ETF market-making? The mere possibility that chasing spreads might have destroyed vast sums of wealth and magically remanufactured it by toying with the supply of ETF shares and spreads versus stocks should give everyone pause. Investors, you should start thinking about these market-structure factors as you wax and wane your exposure to equities. If fundamentals are not setting prices, find the data most correlated to why prices change, and use it. We think it’s market structure. Data abound. And public companies, boards and executives need a baseline grasp on the wholesale and retail markets for ETFs, the vast scope of the money behind it — $4.5 TRILLION in 2018, or more than ten times flows to passive investors last year – and what “arbitrage mechanism” means. So we’re not fooled again (as The Who would say). What do data say comes next? Sentiment data are the weakest since January 7 – and still positive, or above 5.0 on our ten-point Sentiment scale. That’s a record since we’ve been tracking it. So. The market likely stops rising. No doom. But doom may be forming in the far distance.